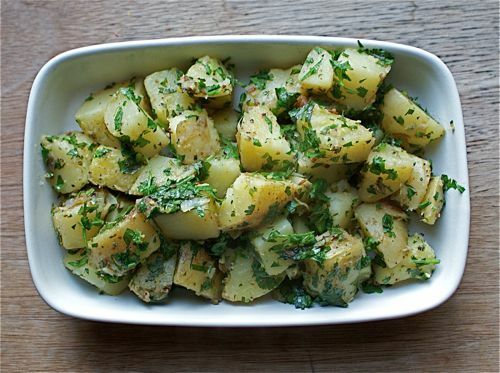 This mildly spicy cilantro sauce is an excellent match for potatoes and particularly suited to new potatoes. Both true new potatoes that are harvested with super-thin skins and come in a range of sizes and the teeny-tiny bite-size potatoes often labeled "new potatoes" at markets. You don't need any particular type of potato, though. Feel free to just cut giant Russet potatoes into bite-sized pieces and proceed from there! Scrub whatever potatoes you're using clean, but do not peel them. If they are bigger than bite-size, cut them into large bite-size pieces. Set them aside (in a bowl of cold water if they're cut to keep them from turning brown). Whirl the ginger and the coriander with 1/4 cup water in a blender or food processor. Set the ginger purée aside. Remove the stem and seeds from the chile, if using. Finely chop the chile (use gloves if you're skin is sensitive to the heat of chiles). In a large saute pan or pot heat the oil over high heat. Add the cumin seeds and cook until they start changing color, about 30 seconds. Add the ginger puree, chopped chiles, and salt. Cook, stirring, until the mixture thickens, about 3 minutes. Drain the potatoes and add them to pan along with 1/3 cup water. Cover, reduce the heat to medium-low and cook until the potatoes are tender, 15 to 20 minutes. Add the cilantro and stir to combine with the potatoes. Serve hot or warm sprinkled with the garam masala and lemon juice to taste if you're using them.